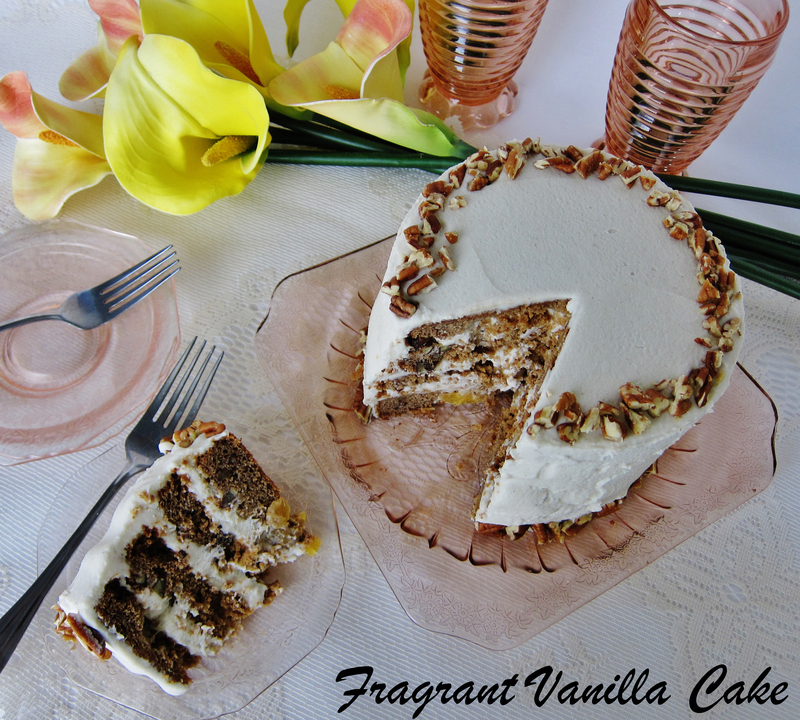 I have always wanted to make a hummingbird cake. I have been hearing about them for years, and the old fashioned southern layer cake appealed to me. In case you haven't heard of them, they are a moist banana and pineapple cake, spiced with cinnamon, studded with pecans, and topped off with cream cheese frosting. What's not to love about that? It sounded like something my Grandma might have made back in the day for a special occasion. Because this is definitely a special occasion cake. Since Easter is coming up, I thought also that if this turned out, it would make a perfect Easter cake to serve as a finale to the meal. So, I went for it and made one. 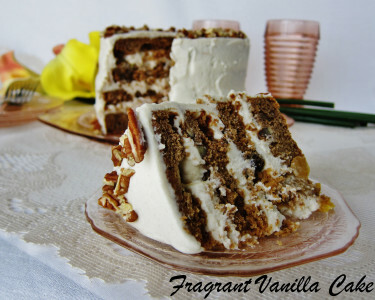 Í used a gluten free vegan banana cake base that I have used in the past, and I swapped out pineapple juice for the coconut milk to make it extra sweet, and added in chunks of pineapple as well along with the pecans and cinnamon that were a must to make this cake traditional. It smelled like heaven as it baked, and I couldn't wait to finish it off with the frosting! For the frosting I used a simple coconut base with a little lemon juice to give it a slight tang reminiscent of cream cheese. It was fluffy and delicious and perfect with the moist cake! I topped it off with more pecans, keeping it simple as far as decorating went this time. OMG was it good. 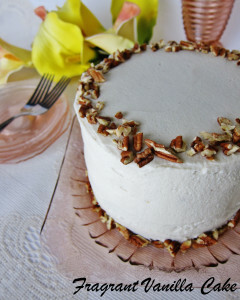 The texture was perfect, the cake was moist and sweet with a little bit of fruitiness, and the pecans gave it a nice crunch. I shared some with my boyfriend Eric, and the piece was all gone pretty fast which should say something. I think this would be perfect for Easter if you wanted something elegant and traditional. Don't let the layers fool you, this is a pretty easy cake to make. Preheat the oven to 375 degrees and position rack in center of oven. Line two six-inch-diameter cake pans with 2-inch-high sides with parchment paper. Coat parchment paper and pan sides lightly with coconut oil so that the cake doesn't stick and line the bottom of the pan with a piece of parchment fit to the pan. Whisk flour, baking soda, sea salt, cinnamon and sugar in a large bowl to blend well. Whisk bananas, oil, pineapple juice, and vanilla extract together in small bowl to blend well, then whisk into the flour mixture until well blended. Whisk in the cider vinegar until bubbles form. Mix in the pineapple and pecans. Transfer cake batter to prepared pans and bake cakes until tester inserted into center comes out clean, about 25-30 minutes. Cool cakes completely in pan on rack, about 1 hour. Cut around sides of pan to loosen. 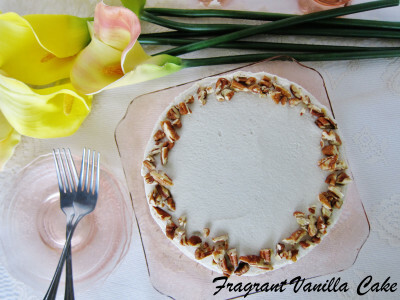 Turn cakes out onto platter; peel off parchment paper. Let cool completely, then place in the fridge to chill until very cold to make slicing easier. When chilled, slice cakes horizontally in half so that you have 4 layers. Meanwhile, to make the frosting, combine all ingredients but the coconut butter in a high speed blender or food processor and blend until smooth. With the motor running, add the coconut butter and process a minute more. Pour the frosting into a bowl and let sit in the freezer until the consistency of whipped cream (this may take anywhere from 1/2 hour to an hour depending on how warm it has gotten). When ready to frost, place one cake layer on a plate. spread frosting about 1/2 inch thick over the first layer, then top with the second. Repeat the frosting, then another cake layer, then more frosting then the last cake layer. Spread frosting over the top and down the sides of the cake. Garnish the cake with chopped pecans. I try to not repeat recipes on my blog, but if you wanted a raw version, you could take the vanilla cake recipe from my "Fragrant Vanilla Cake Sweet and Savory" book, use 1 cup pureed banana in place of 1 cup of the coconut water, replace the other cup of coconut water with pineapple juice, add 1/2 cup chopped pineapple once the batter is finished and 1/4 cup chopped pecans. Keep the frosting as is, just add in a dash of lemon juice. Oh, and add a tsp of cinnamon in with the coconut flour as well. Thank you :)!I hope you do try it someday! It's decided! I'm making this for my birthday on Friday. I'm going back to my family home so I'll have to see what size cake pans we have... I may have to make a 2 layer cake instead. Awesome! So happy to hear you are going to make it Emma :)! Such a perfect Birthday cake! 2 layers will still taste just as good ;). Wow, this looks super tasty! Could I make this NOT gluten free, but keep it vegan? Yes, just use all purpose flour or whole wheat pastry flour instead of the gluten free flour. What is a nut (allergies) free option? Just remove the nuts from the recipe :)! You can use something else instead of the pecans for garnish like dried pineapple. I made this recipe this weekend and I loved it except that my frosting was more like liquid :( It wasn't as thick and fluffy as your frosting. Nonetheless, it was truly an amazing cake! :) Thank you for sharing! Did you refrigerate the frosting long enough? If it is still too runny after an hour and a half, then you may whisk in more coconut butter (coconut milks can vary in liquid levels and this happens sometimes). Happy you made it work though :)! hey Amy-- can't wait to try this! Looks beautiful as always. Just wanted to see- did you use the whole can of chilled coconut milk for the frosting, or just the top part that separates out? Thank you :)! The whole can in this recipe, because you need the liquid in there as well. 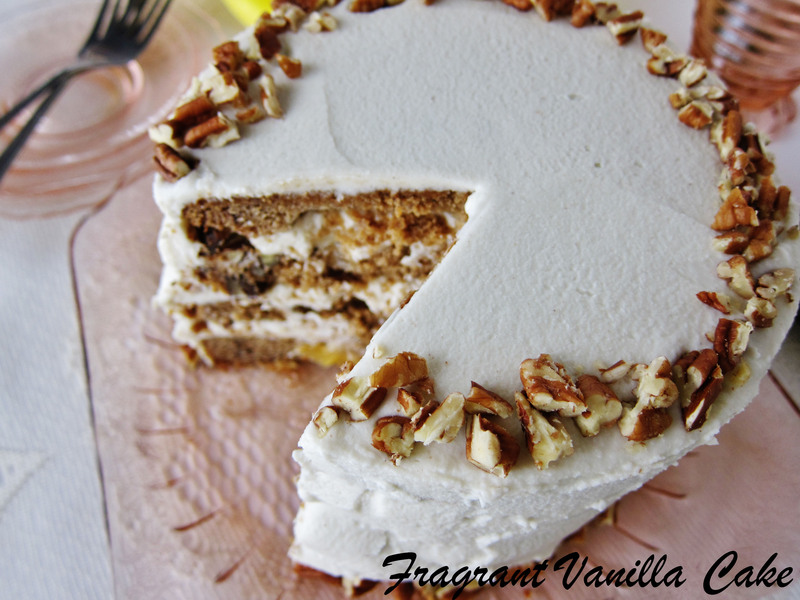 I've always wanted to make hummingbird cake! Thanks for the recipe! You are so welcome, I am happy you found it on my site :)! Thanks for the recipe as always! It's awesome! I'm trying to make vegan humming bird cake with normal flour, and I'm wondering it also works as I put the same quantity of baking soda and powder as you did. It will work the same, just swap out the flour :). This recipe looks amazing; I've wanted a vegan GF hummingbird recipe for ages! I have a question about the icing: the last ingredient is "coconut butter." What is that? It is the whole flesh of dried coconut ground up. You can make your own, by buzzing finely shredded dried unsweetened coconut in a high speed blender until liquid (about 1-2 minutes), or you can buy it at most health food stores. Do you need to keep the finished cake in the fridge or refrigerator? I'm in the middle of making the cake, and it seems like if you need to freeze the frosting, that it will melt off when it warms up. Thanks! Oops, I meant do you need to keep the cake in the freezer or the refrigerator? Now that it's finished and I tried a piece, I would also like to add: WOW!!!!!!! GREAT CAKE!!!! I made it two-layer, and have enough frosting for another cake or two. if you make it two layer, how long do you bake it for? The same amount of time, you just don't slice the layers in half to make four. You are so welcome :)! I am so happy to hear you are going to try it out! I would love to hear what you think of it :)!